It was early Tuesday morning in the village of Kang-Sou, in South Pyongan Province. Song Chang-Won, a 32-year old peasant farmer had gone to his neighbor’s house one morning to ask him a farming-related question. The date was March 25, 1952, and the country had been rent by war and invasion for exactly nine months now. Of much concern to North Koreans were the recent reports of American planes dropping plague and other germs over the country. The government had recently begun extraordinary efforts to contain the outbreak of epidemics. Song’s neighbor was Pak Yun-Ho, a 26 year old peasant born and raised in the village. He had never travelled far from home. Unusually, Pak had been up for hours already. As he later told authorities, he was woken up by what he (and later others) identified as an American plane that had been circling above the village around 4:00am. “The enemy plane flew away after circling several times without strafing or bombing. I couldn’t sleep again after this,” Pak told local investigators. A few hours later he went to the nearby village well to wash his face. It was 6:00am and light was just gathering for the day. The well or small pond the peasants used was about a football field away from the cluster of small homes among which Pak lived. Arriving there, he was shocked to find “dozens of fleas floating on the surface of water in a water jar” a few yards east of the well. Pak had filled the jar with fresh water only the night before. He was “surprised” at the sight of the fleas. He had heard about the claims of U.S. germ warfare in the country. Only a few weeks before, he had received a cholera-typhoid-paratyphoid-dysentery mixed vaccine, part of an intense public health campaign by North Korean authorities, following the germ warfare attacks. He knew he had to report what he’d seen. A North Korean peasant villager gives testimony to the ISC, from video (link). Hurrying back home, Pak ran into his neighbor Song, and took him to see the fleas. Song went to see the large jar, which had a nearly 20 inch (50 cm) opening on top. The fleas looked dark brown, and indeed they were floating on top of the water. The jar itself was surrounded by a good deal of grass and weeds. The chairman brought the information to the local branch of the newly formed Mobile Epidemic Prevention Corps. As elsewhere, public health exigencies took precedence over forensic concerns, and most of the fleas were destroyed immediately. Even so, some of the fleas were gathered using sterile means and saved for later examination. By noon that day, three members of the Mobile Epidemic Prevention Corps were onsite, investigating the strange flea phenomenon. They, too, found “dozens of fleas” floating on the water. Using sterile procedures, twenty fleas were placed into test tubes and sent to the Central Sanitary and Epidemic Prevention Station for examination. The remaining fleas were burned and then buried. The area around the well and the vicinity was disinfected with 6% hexachlorane and 3% phenol. Rats were hunted, trapped and destroyed, because rats were believed to be carriers of bubonic plague, as during Europe’s infamous Black Death. No rats were found that carried plague. (Interestingly, only this year has scientific evidence been published showing the rat-plague connection is most likely false.) Inoculations against plague were administered to all the villagers, but it would turn out to be too late for Pak Yun-Ho. No one saw any fleas falling from the sky, but everyone assumed they originated from the circling American plane. Neither was any projectile or device found that may have delivered the fleas, even though apparently there hadn’t been much of a search (or perhaps the fleas had been sprayed out of the plane, as we shall see had been the case in Japan’s use of plague in World War II). Health officials’ energies went into disinfecting Pak’s house and all the other houses in the village. The district was quarantined. All told, 936 people lived in Kang-Sou. Public health officials had heard about previous attacks of plague in the country. These infections all seemed to follow the path of American planes. The case seemed open and shut. North Korea had not had any history of bubonic plague for 500 years prior to 1952. Six days after he discovered the fleas, Pak developed symptoms of plague. On the morning of April 2, he started to feel ill. He felt weak and suffered from chills and severe headache. He developed a high fever. Pak went to see the doctor, who prescribed him Sulfadiazine, a common antibiotic used for plague at the time. He had a sister with him in the village. Perhaps she cared for him. He had suffered from malaria only the summer before. That night, Pak could barely sleep. His temperature rose to 104 degrees fahrenheit. He had little appetite, but was quite thirsty. The doctor kept him on Sulfadiazine, and placed him on a glucose IV. By the afternoon of April 4, Pak was failing. Delirious, he drifted in and out of consciousness. His lips were turning blue. His vomit was greenish-yellow, and the lymph nodes in his groin were swollen and quite painful. That night, his body temperature started to rapidly fall. He died shortly before midnight. 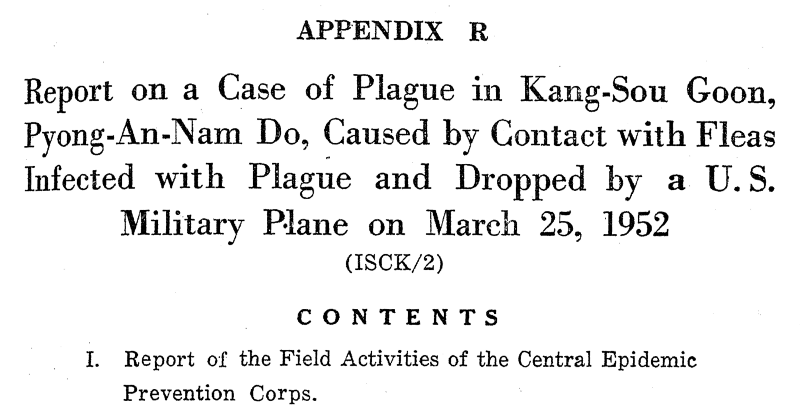 While many efforts were taken to blunt any effects from the presumed U.S. bacterial warfare attack, it was determined that the young peasant from Kang-Sou died from septicemia, secondary to bubonic plague spread by fleas dropped from the American airplane. At least, this was the conclusion of the scientists who investigated the aftermath of this and other attacks. By April 16, the laboratory reports confirmed what all suspected. 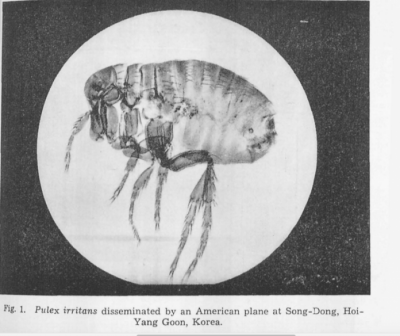 The fleas Pak found were human fleas (Pulex irritans), accumulated in a strange and unnatural way. The bacteria isolated from them, as well as from Pak’s tissues after autopsy, was Pasteurella pestis, which causes plague. Pasteurella pestis is more commonly referred to today as Yersinia pestis, after Alexandre Yersin, who first linked the bacillus to plague. 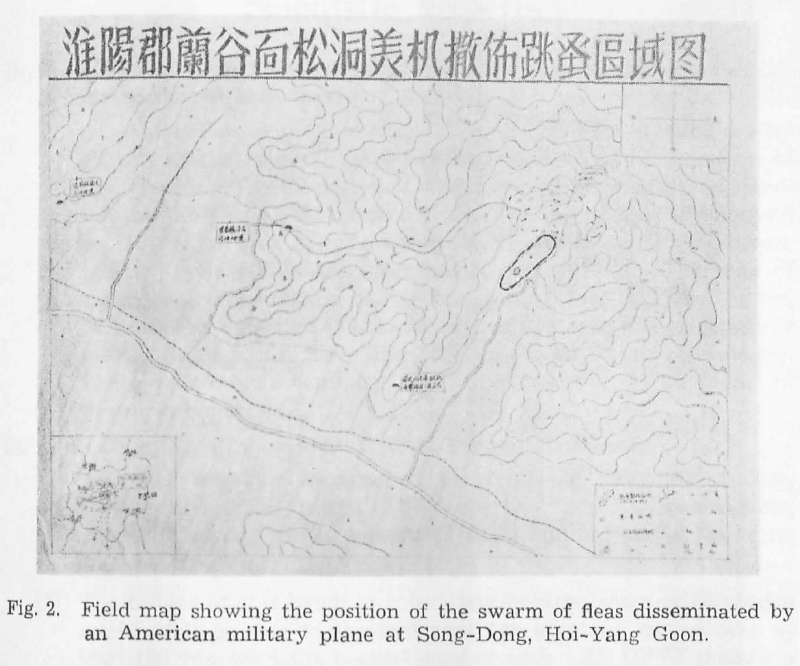 In September 1952, the International Scientific Commission for the Investigation of the Facts Concerning Bacterial Warfare in Korea and China (ISC) issued a report (large PDF, also see embed at end of this article) finding that the U.S. had conducted biological warfare during the Korean War. The ISC linked Pak’s death to the discovery of plague-laden fleas in his village. His death was one piece in the chain of evidence in the case proving U.S. germ warfare. The ISC also described another important instance of fleas carrying plague. A few months after the Kang-Sou incident, on April 23, two young lieutenants from the Chinese Volunteer Forces in Korea went back to pick up some wood they had cut the day before on a bare hillside outside Hoi-Yang, in the Song Dong district of North Korea. They were very surprised to find “a very dense mass of fleas” in the same spot that was clear the day before. The only change was that in the very early morning hours, around 4:00 am, an American plane had been spotted circling the area. Charged with investigating the situation in the immediate aftermath of Pak’s discovery of the Kang-Sou fleas, the medical investigators in Kang-Sou had no actual experience with plague. Plague was unknown in their area. So they were relieved when Dr. Ch’en Wen-Kuei, the President of the Southwest Branch of the Chinese Medical Association came to the village to assist investigators there. He had been assigned recently to the Ministry of Health and Epidemic Prevention Service of Korea. Dr. Ch’en knew a good deal about plague. He was the author of a 1941 report for Kuomintang authorities detailing a germ warfare attack by Japan’s biological warfare department, Unit 731, on the Chinese town of Changteh, in Hunan. He had plenty of experience with both plague and the experience of being attacked by biological weapons. As in Kang-Sou, in Changteh there had been no plague bomb either. In that attack, however, eyewitnesses saw “wheat and rice grains, pieces of paper, cotton wadding” sprayed by air from a plane. Plague in the area developed within a few weeks. In Hunan province, almost 500 or so were to die from this and similar attacks. After World War II, Ch’en’s report was subsequently filed with The International Military Tribunal For The Far East (IMTFE), which conducted war crime trials of Japanese military and civilian authorities. 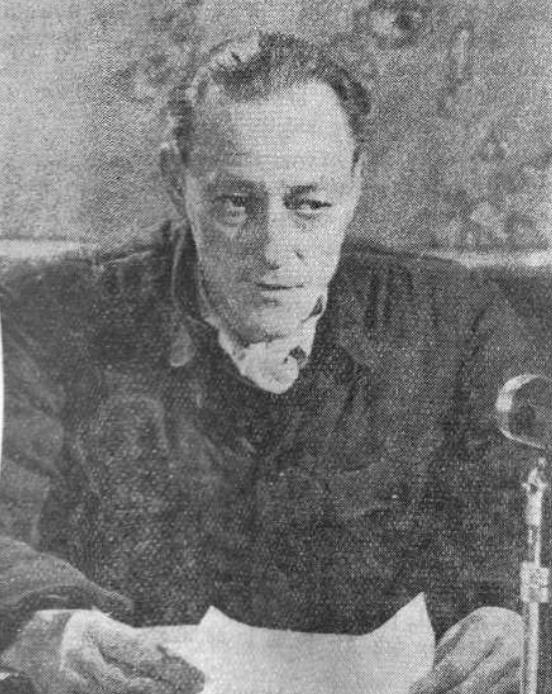 In a controversial decision by the chief prosecutor for the IMTFE, Frank Tavenner, no evidence on biological warfare charges was allowed in the postwar war crimes trials. Supposedly this was because prosecutors could not link the germ warfare crimes to anyone who was specifically on trial. But in actuality, the U.S. had made a secret agreement with Japan’s biological warfare experts not to prosecute them if they gave all their data and expertise to U.S. biological warfare and intelligence departments. Looking now at the evidence first found by Pak Yun-Ho, Dr. Ch’en concluded that the Korean and Chinese scientists were correct in identifying the Kang-Sou incident as a plague attack. In the case of the North Korean village, there was no bombing later in the day. In fact, at this point the U.S. biowar campaign was apparently experimental in nature. “Terrain types to be tested included high areas, seacoast areas, open spaces, areas enclosed by mountains, isolated areas, areas relatively adjacent to one another, large and small towns and cities, congested cities and those relatively spread out…. It would appear that much of what seems strange about the early months of the U.S. biological warfare campaign was due to its provisional, experimental nature. 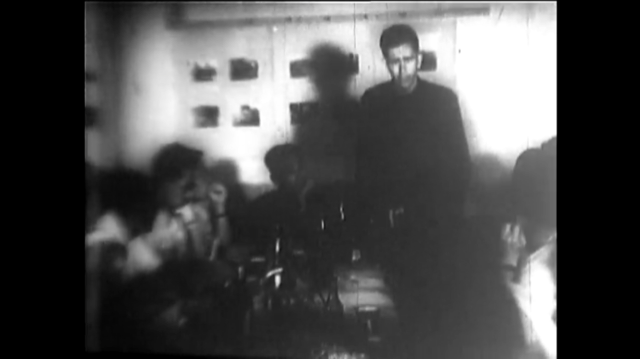 There is a great deal more evidence surrounding the use of U.S. bacteriological weapons during the Korean War, including both the evidence collected by the International Scientific Commission, led by British scientist Joseph Needham, and in a number of statements given both to interrogators, but also publicly (see videos here and here) by captured U.S. airmen. Today, even as the Trump administration moves towards putative negotiations with the North Koreans over “denuclearlization” of the Korean peninsula, President Trump has been appointing new cabinet and national security officials, such as Mike Pompeo and John Bolton, who have advocated an extremely hawkish stance towards North Korea. Now is the time for the full truth to come out about the history of the United States in the Korean peninsula, so that the forces of peace can wage their own struggle with those who seek disastrous war. Read the Needham Report here. Jeffrey Kaye is a Psychologist (retired), blogger, author of “Cover-up at Guantanamo”.